First grade students in Ms. Victory’s & Ms. Rodgers’ first grade class at New Albany Elementary School have been doing a unit of study on butterflies. Students were able to learn about and watch the life cycle of a butterfly. 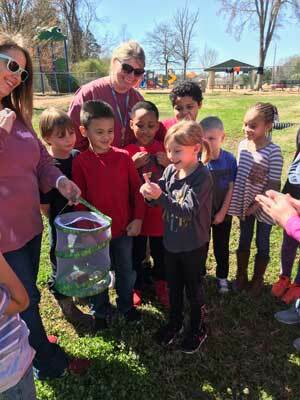 On Friday, March 2, students said goodbye to their classroom butterflies during a butterfly release celebration. 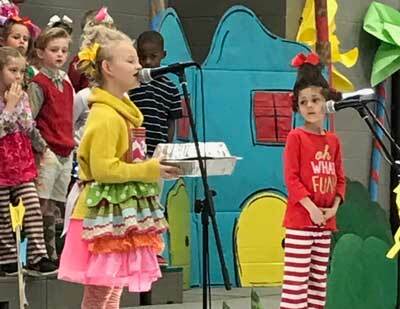 First grade students at New Albany Elementary School presented “How the Grinch Stole the Rhyme” on Friday, March 9 under the direction of Celia House, NAES music teacher. The play was done in conjunction with their study on Dr. Seuss and “Read Across America” week. Students sang “Forever Learning”, “The Blues”, “Rhyme in Time”, and “In the Pages of a Book”. The play was written by Courtney Rutherford, a music teacher in the Pontotoc City School District.